This is my second day in the arena of smoothies, and I thought I’d answer the big question – how are the shakes and what do they taste like? But to understand the answer for me, I’ll put it in context. 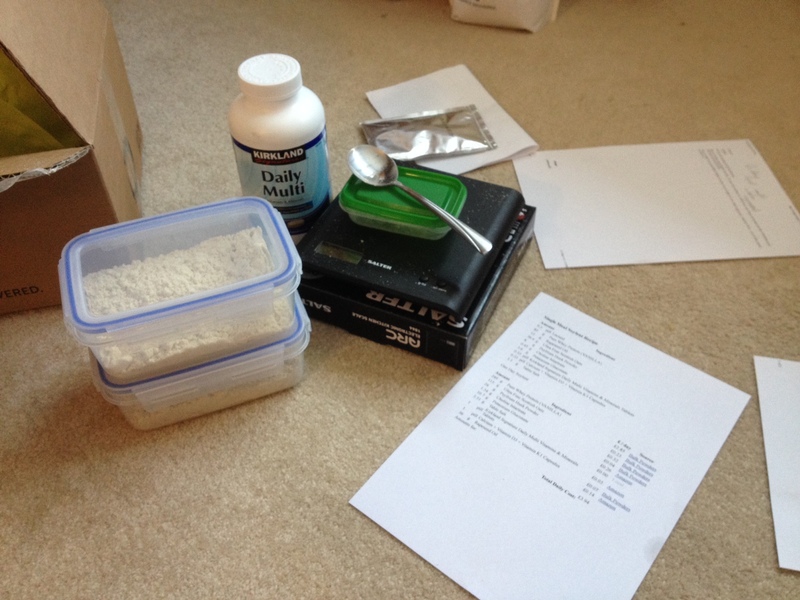 Keen to save space in the brain, I gave a DIY Soylent recipe a whirl. Space in the brain? I know it’s supposed to save time in the kitchen. I know it’s designed with consideration to macro nutrient and micro nutrient balances. I know it’s supposed to make meals on the go a breeze, but these are not my key reasons for plunging into the shakesphere. I need more space in my brain, by which I mean I get decision fatigue very easily -perhaps I have too much freedom and choice. Well certainly in the food arena. This manifests itself when choosing what to eat, and decisions get worse later in the day. This coincides with when I’m eating with my kids, which often leads to some poor decisions when left with two plates of uneaten pizza. I can always do abstinence more easily than I can implement moderation. So it’s easier for me to know that I don’t eat leftover pizza rather than to say that “some” leftover pizza is okay. Taken to extreme, this has led me to DIY Soylent. The theory was that I wouldn’t have to decide what to eat or how much. I’d just chug a third of my daily powder at evenly spaced intervals. So does it have to taste good for me? Not really, at least not in the short term. Which is lucky, as the batch I’ve signed up for, despite being a branch of the Liquid Cake recipe, tastes bland in the extreme. Bland in a vanilla kind of way. Kind of whey really – as that’s the source of the flavourings for the shake – coming courtesy of Bulk Powders. I figure once my palate is cleansed, I can switch in other flavoured protein powders – I have some chocolate waiting in the wings – and also add a few other things like peanut butter. What’s the texture like? It’s drinkable – I add about 500ml of water and 12g of oil to my powders. Without the oil it is too watery. I use a blender to add some excitement to the drink – a few bubbles go a long way. The oat powder I use is somewhat of a grainy dust, and the psyllium husks leave particles no matter how much my Tesco value blender twirls, and the result does line my throat. Not to the point of suffocation, I just like to wash it all down with fresh water after I’ve finished. The texture is just like a smoothie really, but not as creamy. How do you feel on DIY Soylent? Well, I was hoping to feel satiated so that I didn’t think about food or mealtimes and could drone along like a zombie in the hive. But so far it’s been a different story. I get hungry, and a little cranky. I’m getting around 89 grams of carbohydrates a day, and that doesn’t seem too low – though I have suspicions that this is responsible for my crankiness. Being hungry makes me cranky – I used to have a fairly high metabolism. I don’t always feel full after a shake, which is a little disappointing. It takes a while for the food to settle and calm me down. I haven’t continued with my couch to 10k training yet – I’ll see how that feels later today when I run 4km. Last night I was so cranky I had a handful of cashews at the end of the day to keep me level enough for the kids’ bedtime routine. And went to bed shortly afterwards. Also, the gurgling. It’s enough to wake me up and night, but bearable. What scares me? I’m concerned about my mood, and how it will affect my relationships. I also have this faint idea that my brain works best on a diet of simple sugars, and I don’t feel particularly coherent as I type this. Am I going to continue? It’s definitely not plain sailing, and I’m curious to see if that’s just the post-birthday cake comedown transition period I’m in, or if it’s an adjustment period. After all, it’s good not to feel full all the time, and natural to be hungry if you’re eating less. I imagine my stomach will shrink a little, and I’ll pepper in a few real meals in a few days time. For now, I want to see how I respond to the change in food source. I ate vegan for 7 months last year (should that be veganly?) and the first few weeks saw an enormous amount of bloating and confusion. Which reminds me – I think I’ll go and take a probiotic to see if the gurgling will curtail. I’ll probably experiment with chocolate flavour and peanut butter and up the carbohydrates a little too. OK, so it’s Day 2 and I’m sitting here with my head in my hands thinking, “I can’t do anything.” This feeling is preventing me from being effective as a human, so I’m recalculating on my formula. Rather than feeling light, and clear headed, I’m feeling spaced out and like I want to lie down in a dark room. Oh Day 4 was a hoot. Just before I was due to pick up the kids from school I was knocked to the ground by a horrendous and unfamiliar pain which prevented me from breathing properly.